I’m afraid of food poisoning. 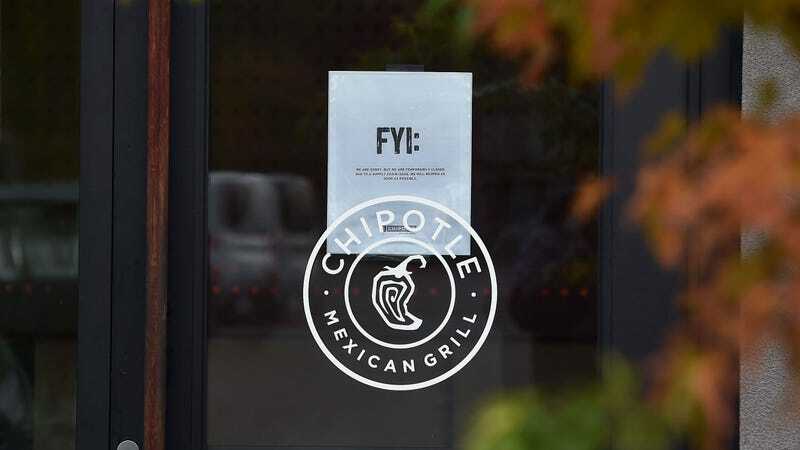 So the never-ending news of nationwide E. coli outbreaks linked to Chipotle is terrifying. But it’s not just the fear of bacteria-laced burritos that’s scary. It’s the faulty farming system that Chipotle’s pioneered. Update 1.15.2015: Chipotle just announced that it would be closing every single store for a food safety meeting on February 8. The stores will only be closed for a few hours. But clearly, I’m not the only one who’s afraid of this problem. What scares me so much about this outbreak situation isn’t the idea that Chipotle makes dirty salsa. It’s honestly terrifying to see how the systemic failure of the chain’s progressive sourcing strategy can cause real harm to people. Chipotle loves to brag about buying local and organic ingredients, but what the ads don’t tell you is that Chipotle knows this decision makes its food less safe. Now, we know why. The Centers for Disease Control (CDC) announced on Monday that it was investigating E. coli outbreaks that infected five people in three Midwestern states. All of them had eaten at a Chipotle within a week of getting sick. I live in Brooklyn, so it seems paranoid to think that Chipotle’s locally sourced meat and produce might make an appearance at my local restaurant. But it’s not—not necessarily. The last round of Chipotle-related E. coli outbreak news came out a few weeks ago, and that time, dozens of cases were reported in states all over the country, from California to Ohio to New York. There were also earlier cases reported in Oregon, Washington, and Minnesota. Chipotle thinks that all of the cases in the past three months are related, but due to faulty record-keeping, it hasn’t identified the ingredient causing people to get sick. “We believe they are related, and are working with the CDC and FDA while they investigate,” Chipotle spokesperson Chris Arnold told Bloomberg this week. Food Safety News reports that nearly 500 people have gotten sick from E. coli outbreaks linked to Chipotle restaurants since July, citing the company’s own internal documentation. Experts say that the bacteria’s DNA in the latest outbreak is different than earlier outbreaks, though both types are highly rare and have been seen only a handful of times by the CDC. Rare deadly bacteria? Mystery surrounding the ingredients carrying it? Faulty record-keeping practices? This is all sounding very, very scary. Scary enough to spur Chipotle founder and chief executive Steve Ells into issuing a public apology on national TV earlier this month. These produce initiatives may make it more difficult to keep quality consistent, and present additional risk of food-borne illnesses given the greater number of suppliers involved in such a system and the difficulty of imposing our quality assurance programs on all such suppliers. That’s unsettling. Chipotle is changing its system, however, and will start sending all of its produce through a central processing facility so that it can enforce better safety standards. This is comforting, but useless to the hundreds of people who’ve gotten sick in the past few months. It’s also not done much to pull Chipotle’s stock up, after it tumbled 30-percent in the wake of outbreak reports. Earlier this year, Chipotle showed the world that it was more committed to trendy marketing than telling the truth about its products. You might remember the company’s big announcement about going “GMO-free,” when the fact remains that its chicken and pork are raised on GMO feed. Why? It’s cheaper. You have to wonder where else Chipotle has been cutting corners. You also have to second-guess other restaurants that are attempting a similarly hippie-friendly stance of going local without putting proper safety checks into place. I’m most afraid of E. coli because I’ve seen people I love fall victim to the illness it causes. A couple years ago, my dad thought he’d caught the flu on his way to visit family in Maine but was rushed to the hospital when his fever spiked to life-threatening levels. The doctor suspects the infection came from fast food he’d eaten while driving. Back when I was in grade school, a friend of mine nearly died after eating cheeseburgers infected with E. coli from a local fast food restaurant, and the company paid him not to reveal which one. I hope Chipotle figures out why people keep getting sick. I really hope the company makes real changes so that the rash of outbreaks doesn’t continue to spread around the country. Until I’m sure both of those things have happened, though, I won’t be eating at Chipotle. This post was originally published on December 22, 2015. It’s been updated with news of every store closing.